Weston Central Children's Centre provides information, family health and support services to young children and their families and carers in central Weston and the surrounding area. 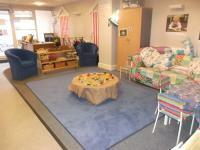 Families with young children are welcome to the various groups, activities and drop-ins at the centre. Please ring us or call in for more details, look at our latest newsletter and What's on leaflet (please see link below) or follow the links for details of regular events at the centre. Weston Central Children's Centre is accessible to all with on street parking (metered), level access to the Children's Centre & disabled toilet. Monday, Tuesday, Thursday & Friday - 9.00 - 4.30pm.